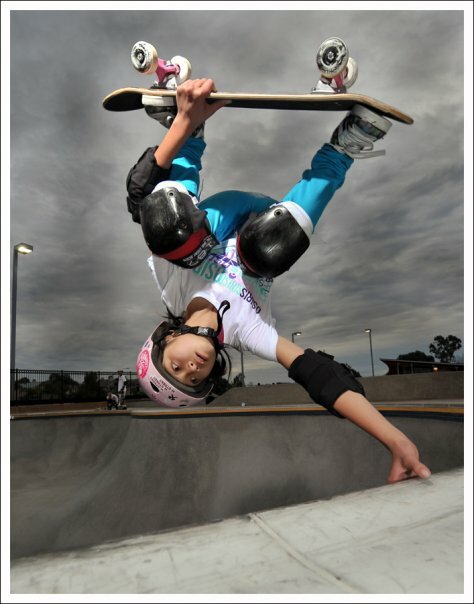 Allysha Bergado started Skateboarding when she was only 7 years old. She lives in El Segundo but was born in Torrance on June 25th, 1996. As of today she is only 13 years old; but even at her young age, she has already made history in the skateboard business as one of the raddest up and coming young female skateboarders in the U.S. : She was featured in the Osiris Kids Video called "Children of the Revolution-The Osiris Youth Movement" and she was the youngest competitor in the 2008 X-Games and Pro-Tec Pool Party. She returned to her second X Games in 2009 with a judicious attitude, as well as ten pounds heavier, which definitely helps in getting more speed in the deep pools. She has entered a multitude of comps, including taking 2nd overall place at the Tim Brauch Memorial Bowl contest that took place last year. She rides “because skateboarding is a thrill. Because I love going fast and doing huge airs! Skateboarding puts me in a whole new world every time I step on my skateboard”. She lists her interests as: skateboarding, guitar, piano, school, listening to music, reading, snowboarding, tennis, basketball, drums, hanging out with friends, and playing on the computer. At least skateboard is #1 on the list. Her favorite videos are: Animal Chin and Feed The Need. I have been trying to interview Allysha for the past 5 weeks. There was always something wrong with the schedule (well, she’s busy, see the list above). Either I was not available or she was not. Curiously, the interview was first supposed to be held at Vans skatepark way before they started the resurfacing of the combi. But, because I don’t like Vans background (it does not look nice on the pictures), we decided (actually I) decided to cancel it and go to another place to do the interview and the photo shoot. At one time, it seemed that the Montclair skatepark was the best place especially because she lives close to it (in skater’s jargon, she’s a local). But it seems that she has not been at Montclair skatepark for some time now. She is a busy gal and has a hectic schedule (again, see above the list of things she does): between the video shoots, the demos at San Diego , the skate sessions (and the above list), I am even wondering: Does she have time to sleep? But, we finally managed to arrange the interview at Vans skatepark. BTW, in one of her latest post to date on Facebook she wrote: “I have skated the Combi Pool 3.0 so many times since it opened, and I am still drawn to skate it again and again and again and again and again and again and again and again and again and again and again and again and again and again and again and again and again and again and AGAIN!”. (Original emphasis) No wonder the Vans combi-pool was Allysha’s first choice for the interview! ISTIA - Here we are at Vans skatepark in front of the newly resurfaced combi pool. How do you like it compared with the old one? ISTIA - Is the coping smaller? Allysha Bergado: - It's definitely more slick; and it is less pushed out. I really like it. It’s like metal coping . It’s not like regular pool coping. ISTIA - Vans is the place where the girls contest should have taken place, but it was cancelled. Why do you think that happened? Are you sad because it was cancelled or is that OK? Allysha Bergado: - I was really bummed it was cancelled because the contest is very fun. If it had taken place it would have been my third year doing this contest. I really like this pool and I have been skating a lot lately to practice before the contest; but they cut it out, so there are a lot of girls that are really bummed that it’s not going to happen anymore. But they say they might do their own individual contest. I heard that Cara-Beth and Mimi may want to put on their own contest. That would be really cool and fun because they are very supportive of girls skateboarding. ISTIA - Do you know why they cancelled it? Allysha Bergado: - No, I don’t know why. There should be a meeting sometime this month about the contest explaining why they cancelled it. But I’m not sure why they did cancel it. ISTIA - Do you skate a lot at Vans? Allysha Bergado: - Yes. I try to come up here every week, but when they redid the pool I could not come here because I could not skate the pool. All you could skate was the mini-ramp and the street, so because of that I mostly went to The Cove Skatepark. But now I will come here again because they redid the pool. ISTIA - I saw a lot of pictures of you with Christian Hosoi, Lester Kasai, Lonny Hiramoto, Lance Mountain, etc… those guys are considered masters. How is it to regularly skate with masters? Allysha Bergado: - I think it’s pretty cool. It’s really cool to get to know those guys because they are amazing people who happen to be very talented skaters; and they are very inspirational. You get the chance to learn tricks from them and that is very cool. ISTIA - Do they teach you? Allysha Bergado: - Yes, when I ask them, they show me how; like they try to help me out when I’m trying to learn a new trick. ISTIA - With whom do you skate most? Allysha Bergado: - I have been skating a lot with Tony Mag who has been my mentor. 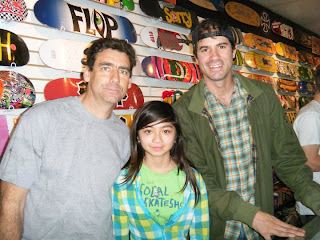 And I love having the chance to skate with the Pros when they come out to skate and practice for Pro-Tec. Also, whenever I see some of the girl skaters, I try to hang out with them because I don’t see a lot of girls skaters out there. ISTIA - Who got you into skateboarding? Allysha Bergado: - My dad and my uncle. When I was six, I saw them in front of my house and they were riding on their own skateboards. It looked kinda fun to me and on my following birthday I asked for a skateboard, so they got me one and from then, I just started skating. ISTIA - Who has more style you or your father? ISTIA - Was he into pool? Allysha Bergado: - No. When he was younger, he skated a lot of street but now he is skating pools because he can’t do street anymore. ISTIA - Do you prefer vert or steet? ISTIA - Who were your earliest skateboarding influences? Allysha Bergado: - My Dad influenced me when I started skating, but now I look up to different pros like Tony Mag, Ron Allen, Bucky Lasek, Lester Kasai, Christian Hosoi, Chris Miller, and Rune Glifberg. I also look up to girl skaters such as: Lyn-Z Adams Hawkins, Karen Jonz, and Rachel Reinhard. ISTIA - You said your father was the 1st influence on you, but he was a street skater. So why did you finally pick up vert instead of street skating? Allysha Bergado: - I mainly picked up vert because when I first started skating, the parks that I went to all had bowls and mini ramps. ISTIA - Do you see a difference between vert and pool? Allysha Bergado: - The vert is the big transition; 13+ foot tall, but its back and forth, but pools are more like bowls and swimming pools, you carve more, it has more features. ISTIA - You live in Montclair , you are surrounded by skateparks, how do you like it? Allysha Bergado: - I like it where I live because they really have a lot of good skateparks there. I think if I lived somewhere else, I probably would not have gotten into skateboarding in the 1st place or put in as much; so I am just glad that I live where I live. ISTIA - You were born in El Segundo, which is kind of Dogtown (or close enough) but you are now living in Montclair , which is the Badlands , do you consider yourself from Dogtown or the Badlands ? ISTIA - How about the old rivalry between Dogtown and the Badlands ? Allysha Bergado: - Ha, I think that does not exist anymore! And I don’t think skaters should get into rivalries because skateboarding is all about having fun. ISTIA - What are you preferred skateparks? Allysha Bergado: - Does Woodward count? ISTIA - I don’t see why not! 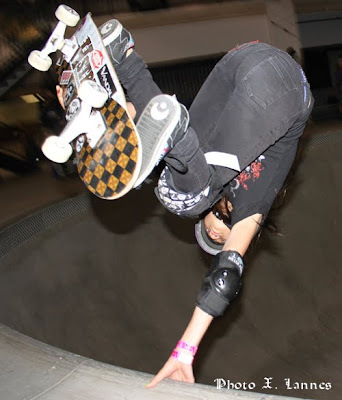 Allysha Bergado: - OK, so my five best skateparks are, Woodward first. Woodward is the best because you have everything there vert, ramp, pools, they have good street. They have training courses, warm up gymnasitics. Then I also like the new Fontana ..
ISTIA - They are going to redo it . They are adding more pools and a cradle… So, how many skateparks have you skated? ISTIA - What are you favorite features in skateparks-pools ? ISTIA - Are you in another video or are you shooting or soon to shoot another video? Allysha Bergado: - No, I have not really done other skate video, but SoCal Skatepark is about to release a new video and maybe Osiris will come with a second video. ISTIA - How about the commercials? Allysha Bergado: - Oh Yes! I have done two commercials. One for Disney Channel. It’s called “Get your head in the Game” and it’s like something where they feature like a talent for kids getting active … It features me and then it also features my friend Austin. We got to skate, we got interviewed, that was pretty cool. It’s airing on Disney channel right now. And then, I also made a commercial for Nickelodeon a while ago. It was for eating healthy and getting active. ISTIA - How about this video that you just shoot this past WE? ISTIA - When will this one be out? ISTIA - Who are the other skaters in all those commercials? ISTIA - What’s the Berry Mini Mag project? Allysha Bergado: - That’s at school. My teacher Miss Berry has a project for language art which is a mini magazine. We had to pick up papers from a bag and talk about our favorite person, but they also have other stuff too and I got Apollo Ono, the speed racer for ice skating so I have to make a magazine on him, but they also had Tony Hawk and I wish I got him because it would have been easier since I skate…. ISTIA - Ahahah! Who got Tony Hawk? Someone that does not skate? Allysha Bergado: - It was in Texas , it was pretty cool. I was down there with Tony Mag and Lyn-Z Adams. The bowl is pretty cool, its really big they have like a big cradle and a deep end like a square and I think it was a pretty cool contest. It is dedicated toward kid named Johnny Romano. ISTIA - Did he die of cancer? Allysha Bergado: - Yes, something like that. I don’t really remember. He is a legend there. ISTIA - Can you tell me about the Tim Brauch Contest? You ended 2nd just after Lyn-Z? Allysha Bergado: - Yeah, San Jose at lake Cunnigham . You know the park? Allysha Bergado: - That was awesome, the pool is really good. I would like to go there again. And I want to do the contest again this year. It was really fun that whole skatepark is cool because they have a big bowls and a full pipe. ISTIA - Monolith? (I show her my “I Skate Therefore I Am” tee shirt) Like this? ISTIA - You were also at Clash at Clairemont, right? That was like 2 weeks ago? ISTIA - You were there for the contest? Allysha Bergado: - No. I was there doing demos. I skated the vert ramp and the pool for the vert demo. That was pretty cool. A lot of my sponsors came in together. They came to help raise money for the cancer. I would like to thank Mike Rogers for being able to put on that contest, I mean the event. He is a cancer survivor and so he put on that event to raise money for cancer. ISTIA - How did you meet Tony Magnusson? Allysha Bergado: - There was a guy, a photographer, he came down to Montclair skating one day and I was there so he knew Tony Mag, he talked to Tony Mag about me so after that, Tony Mag said: “We should meet up”. We went up to Clairemont skatepark in San Diego and I met with Tony Mag and we talked and then we skated and then it just went from there. ISTIA - What tricks can you say: this one is coming from Tony, he taught me that one? Allysha Bergado: - He hasn’t really taught me tricks. What he does is: he helps me with getting better at the tricks and improving my technique. My airs for example, at first they were lower and not very good and he taught me how to get them higher and he taught me a technique like wait until you are in the air first and then you grab… He is also helping me on a lot of other tricks …. Allysha Bergado: - I think Tony is shredding more, because he has been skating for a very long time and he is a good skater you know. And at his age he is still doing rad tricks, pulling up 540’s and stuff like that. He is a very cool guy, he sponsors me with Osiris and H-Street . He made H-Street in the past and stopped doing it, but now, H-Steet is back up. ISTIA - It’s been two years now for the new H Street , right? ISTIA - What was your first board sponsor? Allysha Bergado: - My first board sponsor was a company called Gridlock. They are in the Badlands area, it was like a little company. Then I moved on to Termite and after Termite I got on H-Street . ISTIA - Who are you favorite skaters of all time? 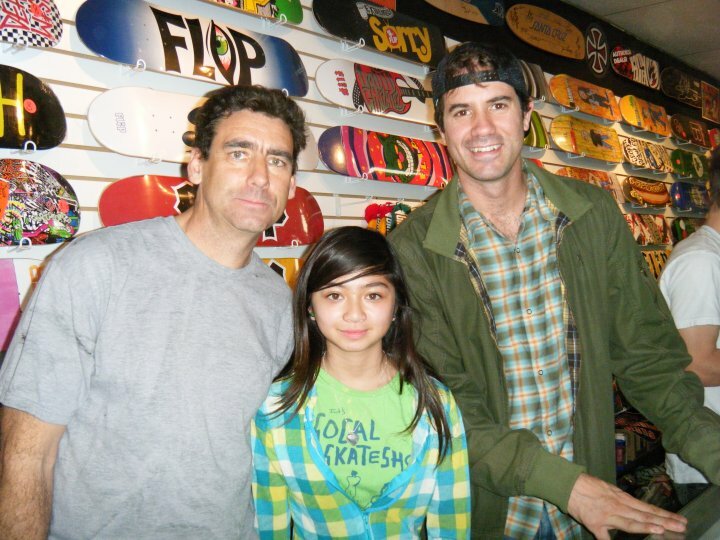 Allysha Bergado: - Tony Mag, Bucky Lasek, Paul Rodriguez, Chaz Ortiz. And there’s a little kid thats very cool, Louis Lopez. ISTIA - Yeah! That kid is rad! Allysha Bergado: - Yeah!! And Curren Caples , Lyn-Z Adams, Karen Jones, Mimi and Cara-Beth. Also I like Tony Hawk. Allysha Bergado: - Yeah they say that but I don’t think vert is dead. They just say it because they think street is cooler than vert skating because you don’t wear any pads, they say it’s more gnarly and stuff you run smoothly and you are just destroying property, that there’s no other way than skating rails and stuff. But I don’t think vert is dead! There are a lot of great vert skaters like Alex Perelson, he is the only kid to do the 900, he is only 19 years old. Vert skating is really fun to watch and we are getting higher all the time. And I don’t think vert skating is dead because there are a lot of little kids that are getting really good at vert and one day they will be pro. ISTIA - You were saying that in street you don’t have to use pads and helmet and in vert you have too. Can you skate vert without pads and helmet? Allysha Bergado: - Yes, you can, but it’s more dangerous! Because when you fall if you have knee pads, you fall on your knees… If you don’t wear knee pads in vert or pool and if you just fall that is very dangerous because you can seriously injure yourself… But I know in street skating more people are wearing helmets but they say they do not want to wear the elbow and knee pads because they say that makes them feel less loose and they say they aren’t able to pop and stuff if they wear pads. ISTIA - I hear that a lot. Street skaters say they can’t skate with knee pads! What’s that nonsense? I do 2-3 hour sesh with knee pads! You do 2-3h sesh with knee pads. What’s the problem? ISTIA - Maybe they just feel that’s not cool to wear pads? ISTIA - I have heard that street skaters actually use pads and helmets but that skate magazines are asking skaters to remove their pads before they take pictures because that’s not cool to wear pads in the magazines…. ISTIA - Oh yes, I have seen a lot of those kids with fake pads at Etnies. They just wear pads because otherwise they could not even enter the skatepark… So, you always use pads, right? Allysha Bergado: - You have to have both! But knee pads save you more. Like if you have a helmet and if you want to fall how do you do it without the knee pads? Now, I see a lot of kids that have to fall on their buttocks because they don’t have knee pads. If you fall out from an air, it’s very dangerous to run and because of that, kneepads are very important because it makes you safer when you fall. Allysha Bergado: - Oh yes. That’s true. I would not throw myself in a pool or a bowl without knee pads because I know if I would fall, I would like something in my head that would prevent me to do it right. I’m not used to falling or running on some parts, what’s why I think knee pads are very important when you are skating vert. ISTIA - Who is your pads sponsor? Allysha Bergado: - My pads, I have 187. They are really cool. I met the guy who makes them. He is really good at making pads. My mom said she got to see them make the pads in the factory. And my helmet sponsor is S-One. ISTIA - Who are you other sponsors? ISTIA - What is it to be a pro at 13? Allysha Bergado: - It’s kinda weird to think that I am a pro. It’s different for the girls, I think it’s easier for us to go pro. I don’t like to say that I am pro but I think I am kind of in that category but I’m still a little kid, so I try not to take that seriously So I think when I get older I will touch on more for other people ..
ISTIA - But, what do you want to do in the future? Do you want to skate at professional level? Allysha Bergado: - Yes. I want to be pro and skate really good. I want to be able to do a lot of tricks and do my best before I can’t skate anymore, like when I get older … But I also want to first finish college and then, maybe like help run a skateboard business or work for a skate company that would be something really cool. ISTIA - Or maybe run your own skate company? Allysha Bergado: - Yes! Or maybe work for Osiris, that would be cool. ISTIA - What does your mother think about all this? Is she supportive? Allysha Bergado: - Yes, my mom is very supportive, she drives me around everywhere. She stays, she doesn’t really push me to skate. She just encourages me to skate and then, she motivates me and she is really cool, she is just a laid back mommy. Like, if I wanna go skate she is taking off her time too. Like for example she took me here today and whenever we can, we go to San Diego and I think I will try to go more often to Venice because that’s a place where I really don’t go enough. Allysha Bergado: - Yeah, really. ISTIA - Who is most supportive, your dad or your mom? Allysha Bergado: - They are both supportive. My mom takes me more to the events because my dad has to work more but they are both equally supportive. ISTIA - I see you play the guitar, when did you start? Allysha Bergado: - I started when I was roughly 10. I took lessons and then I stopped. I probably stopped when I was 12, maybe. That’s when I started skating a lot more. But I’m trying to pick it back up because I was getting good at it. I was learning how to play a lot of new songs and my mom says I should try to keep doing a lot of different stuff like guitar, skate. I would like to learn to play drums… maybe… But, then again, I think guitar is pretty cool. ISTIA - What is your favorite kind of music? Is the one you listen to and the one you play are different? Allysha Bergado: - Well, yes and no. I play rock music like AC/DC and stuff. I also like to listen to rock and stuff and I also like a lot Hip Hop kinda stuff. I don’t really like rap, I like Hip hop. I like Eminem. ISTIA - Yes. Hip Hop and Rock! Like the Beasty Boys, Black Eyed Peas and things like that? Photos: Xavier Lannes & Michael Chantry (used by permission). Other pictures from Allysha's Facebook page. Love to see young girls ripping! great interview - thanks for posting. Allysha - you RIP!!! YES ! GO ALLYSHA, YOU ROCK ! Allysha I love you! Skateboard on. I love to skateboard I am very good to!